We have Bees! 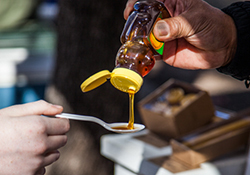 We are thrilled to announce the addition of a Teaching Apiary to the Sustainable Food Center Teaching Garden to bring pollinator awareness to the community. 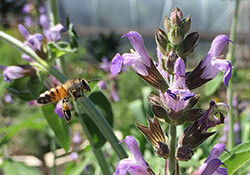 In conjunction with Earth Week, April 16-23, we want to celebrate the pollinators that provide us with the bounty of food crop varieties that we consume and maintain biodiversity and healthy ecosystems. We have an exciting week planned with activities for both children and adults - read on for our list of all the activities you can get involved with. 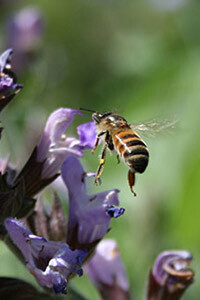 Please join us in our week-long celebration of bees! Spring crops are here and Tecolote Farm has everything to add some flair to your dishes. Check them out this weekend for fresh salad mix, spinach, and argula! Looking for that perfect slice of bread for your sandwich? Look no further than Texas French Bread! With great a assortment of bread like sourdough, ciabatta, and baguettes, you’ll be sure to find something that fits all your bread needs. 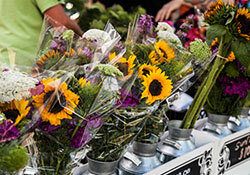 SFC Farmers’ Market at Sunset Valley is the perfect place for you and your family to enjoy a Saturday morning. Stop by the market and check out the great produce from Farmshare Austin; they have everything you need make healthy and delicious meals! Don’t forget to visit Featured Vendor, Happy Vegan Baker, for their delicious assortment of vegan baked goods and prepared foods; we recommend a cupcake or the mac n cheese! Can’t make it to Sunset Valley? 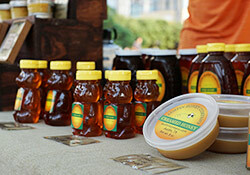 Check out Happy Vegan at SFC Farmers’ Market Downtown and at The Triangle. As one of our Farm to Plate sponsors, we'd like to say thanks to JP's Peace, Love & Happiness Foundation for their support. John Paul DeJoria founded JP's Peace, Love & Happiness Foundation in 2011 and invests in charities that share the core values his companies - sustainability, social responsibility and animal-friendliness.